Tahini is a paste made of sesame seeds. It is high in vitamins A, E, F and T, as well as B vitamins, biotin, and choline. Tahini is also 20 percent complete protein – higher than most nuts, great for vegetarians and vegans. Tahini is also high in minerals such as magnesium, potassium, iron, and phosphorus, and is an excellent source of calcium. I like using it in salad dressing, hummus, power balls and spreads. I’m sure you all know the slices of apple and nut butter is a good flavour combination as well as a great snack between meals. I added a table spoon of tahini in the loaf batter and used another table spoon to drizzle over the cake. 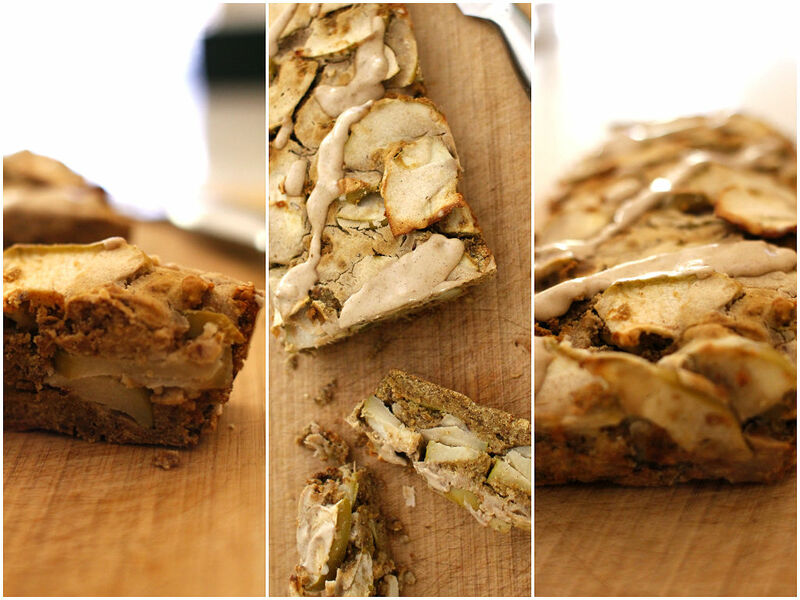 It tastes beautiful and also adds more nutrition to this guilt-free cake. You can also add some chopped dates or walnut in this recipe if you like. Gently beat eggs, melted coconut oil, 1 tbsp of tahini paste and maple syrup in a large bowl. Add all dry ingredients into a bowl and combine well with a spatula. Pour the half of the mixture into a prepared loaf tin, put the layer of sliced or grated apples, then pour the rest of the mixture over the apples, and top with more apples on top. Bake in the preheated oven (180) for 45 minutes until cooked. Take it out of the oven and cool down in a tin for 10 minutes. Mix 1 tbsp of tahini with yogurt in a small bowl. Drizzle over the cake and sprinkle cinnamon before serve.